In normal times, the U.S. president's loss of the House of Representatives in the midterm elections would force him to tack toward the middle, and try to find areas of compromise to allow the government to function despite divided control. But Donald Trump has been anything but a normal president. Instead, Trump is more likely to double down on the strident nationalism that has brought him this far, inviting conflict in a bid to bolster his own re-election bid in 2020. For Asia this means there will be no relief coming from the "America First" policies that Trump has pursued over his first two years in office. The president's approach—disdain for the restraints of global trade rules, bilateral negotiations that exploit U.S. market power, and rising strategic competition with China—will remain intact. China will have to find ways to cope with Trump's nationalism, rather than gambling that it can wait the president out and hope for the return of a more traditional American approach to the world. Trump himself signaled on Wednesday that the trade war with China could help remedy the American domestic divisions laid bare in the election. He said, "One of the things I think can help heal is the success of our country." He gave trade relations with China as an example. The impact of the U.S. is so outsized that even its midterm elections garner widespread international attention. And in this year's vote, Trump was so unpopular in most countries that many around the world had been hoping for a "blue wave" in which Democrats would win crushing victories in the House and possibly the Senate, thereby shackling the president for his final two years. The result, instead, was far more mixed. The Democrats did retake the House, primarily with the support of educated, suburban voters, especially women, who were put off by Trump's antics. But the president's relentless campaigning in Republican states in the weeks leading up to the vote also paid off. The Republicans picked up additional Senate seats, solidifying their majority, and also won key governor's races in Florida and Ohio. Trump's midterm losses proved to be far more modest than Barack Obama in 2010 or Bill Clinton in 1994. More important is the way Trump won that partial victory. 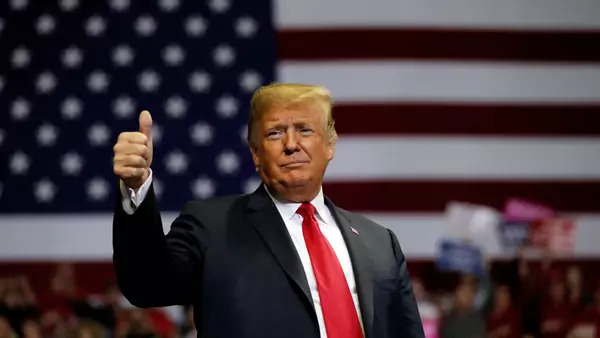 Despite enjoying the strongest economy and lowest unemployment rate in more than two decades, the president did not campaign primarily on his economic record. Traditional business groups like the Chamber of Commerce and leading Republicans like outgoing House Speaker Paul Ryan, had implored Trump to talk up the strong economy. But he flatly rejected that advice, instead waging a fear-based campaign focused on the supposed dangers of illegal immigration. The final Republican campaign ad, which implied that a migrant caravan of several thousand Central Americans heading across Mexico for the U.S. was filled with would-be murderers, was so racially-charged that even the conservative Fox News refused to run it. Trump shrugged off the complaints, saying that "well, a lot of things are offensive." The lesson Trump will take away from the midterms is the same one he learned in 2016—he ignored the establishment, ignored expert advice, ignored norms of civility, and instead followed his instincts. And the outcome was much better for the Republicans than most had expected. What does this mean for the next two years? In broad terms, it means more of the same—Trump will continue to break diplomatic norms, push around allies, and use threats and bluster to boost his standing with his political base at home. On trade, there will be plenty of opportunities available. The administration is poised on January 1 to increase tariffs from 10% to 25% on $200 billion in imports from China unless Trump and Chinese President Xi Jinping can negotiate a truce when they meet at the end of this month. And the Commerce Department's report on whether auto imports threaten national security, which could lead to the same sorts of tariffs already imposed on steel and aluminum, is due no later than February. The new House Democratic majority will likely do nothing to knock Trump off his trade game plan. Without control of the Senate, the Democrats have no ability to throw legislative obstacles in Trump's way. And on trade, most Democrats are cheering him on. Richard Neal, the Massachusetts Democrat who will chair the once-powerful House Ways and Means Committee, is friendly to organized labor and has voted against several trade deals, including the original North American Free Trade Agreement. Bill Pascrell of New Jersey, who will take over the trade subcommittee, voted against the U.S.-Korea trade agreement. The real restraints on Trump will be the economy and the markets. Trump prefers soft targets—going after the "caravan" wasn't going to upset Wall Street. But when Bloomberg last week reported that the administration was drawing up plans for tariffs on all remaining imports from China—a story that roiled the markets briefly—Trump quickly arranged a phone call with Xi Jinping and calmed markets by announcing that it had been "a long and very good conversation" and that trade discussions "are moving along nicely." There will be political incentives for Trump to keep the trade battles under control. The U.S. economy is almost certain to slow over the next two years as interest rates rise and the stimulus effects of the big tax cut wane. Trump will want to place the blame on Democratic control of the House, not on the disruptive effects of tariffs. So negotiated deals, between the U.S. and Japan on cars and agriculture, and possibly between the U.S. and China on some aspects of their broad trade dispute, are certainly possible. But they will come on Trump's terms—bilateral deals that break established norms, and allow the president to brag about big victories even if the substantive changes are small. That will be hard for China especially to swallow. The midterm outcome has put to rest the hope that American voters would rein in their president and force him back closer to the old normal. For the next two years, and possibly longer, Trump will be Trump. Asia, and the rest of the world, will have to figure out how to live with that.